IAS Prelims Exam results are not announced yet and the IAS Main Exam is coming near day by day. In the whole process, the candidates are trying to cover the whole syllabus through the text books, newspapers, journals and of course Wikipedia. But it is a very cumbersome process and the candidates end up in missing various important issues relevant for the Civil Services Main Exam. 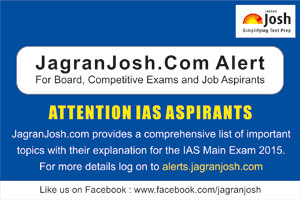 To overcome this issue, Jagranjosh.com came up with the solution, we are providing a comprehensive list of the important Topics for the IAS Main Exam 2015. UPSC IAS Main Exam covers the whole lots of topics. This requires a very comprehensive studies of the newspapers and the government policy and vision documents. In the whole process of preparation, various topics go untouched or overlooked by the candidates. This list is not an exhaustive list and will be amended in leaps and bounds.